Thank you for your patience during the power outage on April 11. Here are some details on what happened and how we plan on preventing it in the future. During some excavating on the east side of the dock at the edge of Millhaven Creek the excavator inadvertently came in contact with a Hydro One temporary underwater electrical power cable. This contact caused the power to several homes in Millhaven and the entire island to go down for a period of roughly 3 hours. We then contacted Hydro One to dispatch their workers to the site to fix the issue. They were on scene quickly and worked to isolate the damaged portion of the electricity cable and restore power. Service was restored to all customers around noon. To ensure this doesn’t happen again, Hydro One has isolated this temporary cable and do not plan to reinstate it until they can properly install a permanent cable under the creek. Again, we would like to apologize for any inconvenience this may have caused and thank all those affected for their patience. Thank you everyone for your patience during the power outage today. Power has been restored to all customers. We apologize for the inconvenience. Residents we are working with Hydro One to restore hydro as soon as we can. We apologize. During excavations at the Millhaven site an underground power line was struck. We will update when we have more information. Please be advised of upcoming extended construction hours starting Monday, March 18, 2019 at the Stella Ferry Dock only. We will be working evenings from Monday, March 18, 2019 to Saturday, April 13, 2019. This work is to facilitate construction of the pier before we become restricted from carrying out in-water work. The work will occur Monday through Saturday between the hours of 7:00am and 11:00pm. No Sunday work will be carried out. We will plan the work so that noisier construction activities (e.g. pile driving) will occur during daytime hours from 7:00am to 7:00pm. Less noisy preparation work (e.g. welding and prep work for the day crew) will occur in the evening hours from 7:00pm to 11:00pm. Please be advised that paving of the Stella dock marshalling area will occur on December 4th and 5th (weather and schedule dependent). Updates on timing will be provided via email and our project twitter (@A_I_Ferrydocks). There will be changes to the marshalling area that will affect how vehicles marshal. During paving marshalling will be done as a single file line on Stella Forty Foot Rd. Please follow the instructions of construction and ferry staff. Temporary parking for approximately 8 vehicles will be available along the construction laneway off Front Road just east of the island radio station (see onsite signage). Paving is anticipated to only take 2 days (weather dependent) after which, parking will return to its previous location and marshalling will be the same as at Millhaven (i.e. line up in rows). Line painting will be completed shortly after paving is completed. Paving of the marshalling area at the Stella dock has been delayed and will not be completed until a later date. Updates on timing of the paving will be posted to our twitter, website and sent via email. Parking and marshalling areas will be reopened until the start of paving operations. Please follow onsite signage and the instructions of construction and ferry staff. Please be advised that paving of the Stella dock marshalling area will occur on November 29th and 30th (weather and schedule dependent). The current parking area will not be available from Tuesday November 27 through Friday November 30. Temporary parking for approximately 8 vehicles will be available along the construction laneway off Front Road just east of the island radio station (see onsite signage). Update: Paving operations at Millhaven marshalling area. The paving work in the Millhaven marshalling area will be complete by 8:00 p.m. on Thursday, August 30, 2018. The temporary parking area north of the pedestrian shelter will be open at that time. Thank you for your patience and cooperation during this work. Please be advised that paving operations for a section of the marshalling area at Millhaven will take place on Wednesday, August 29 and Thursday, August 30, 2018. There will be no parking permitted in the temporary parking area that is north of the pedestrian shelter. This will remain in effect until Friday, August 31, 2018. Ten alternative parking spots will be available on the south side of the marshalling area and 5 parking spots will be available in lane 6 of the Millhaven marshalling area. These spots will be marked to identify where parking is permitted. Work to resurface the road on Highway 33 at the Amherst Island docks in Millhaven is scheduled to begin on Monday, August 20, 2018. Construction work will be undertaken along Highway 33 around the entrance to the Millhaven terminal. The work is necessary to allow for resurfacing of the road and minor widening to accommodate the extension of the westbound left turn lane into the ferry terminal area. You can expect periodic delays and lane closures along Highway 33 around the entrance to the Millhaven terminal between 7:00 a.m. and 8:00 p.m. from Monday to Saturday to accommodate the work. Typical delays are between 5 and 10 minutes but at times could be as long as 15 minutes. Please watch for and follow the instruction of on-site personnel as they direct traffic. This work is weather dependent and is anticipated to continue until approximately September 22, 2018. The public boat launch at Stella will be closed from Tuesday August 7 to Thursday August 16 as part of the construction on the new permanent dock. The public boat launch at Stella is OPEN and will not close until after the August long weekend. Due to the rain on July 25th we were unable to start work in the area. As a result, the PUBLIC BOAT LAUNCH will be CLOSED from TUESDAY, AUGUST 7TH to THURSDAY, AUGUST 16TH to allow for construction of a toe-wall as part of the work on the new permanent dock. Continue to watch our website and follow us on Twitter (@A_I_ferrydocks) for more information and updates about the project. Please be advised that the public boat launch at Stella will not be available for use starting Wednesday, July 25th to the afternoon of Friday, August 3rd to allow for construction of a toe-wall as part of the work on the new permanent dock. Our apologies for the short notice but doing this work now will ensure that the launch is open and ready for use for the upcoming August long weekend. Thank you for your patience and understanding as we continue work to complete the new Amherst Island Ferry docks. Continue to watch our website, and follow us on Twitter (@A_I_ferrydocks) for more information and updates about the project. Check out our Summer 2018 Construction Newsletter. We’ve updated our photo gallery! Check out the new pictures to see how construction is progressing. Good news! The Amherst Island ferry temporary docks are open and in service. The new docks are end-loading which should improve ferry operations as you can now drive straight on and off the ferry. There is a change to the way you board the ferry and to available parking at both docks. There is signage and flagpeople on the site to help. Refer to these images for Stella and Millhaven for what this means to you. Just a reminder that the transition to the new temporary docks at Millhaven and Stella is tomorrow morning (Friday March 9, 2018). This change is weather dependent and will be effective on the first ferry of the day from Stella at 6 a.m. There will be signage and flagpersons on-site to help with the transition. The new temporary docks are end-loading which should improve ferry operations as you will be able to drive straight on and off the ferry. NOTE: There will be a change to the way you board the ferry as well as to available parking at both docks. Please refer to these images for Stella and Millhaven for what this means to you. The anticipated target date for the opening of the new temporary docks at Millhaven and Stella is the morning of Friday March 9, 2018 (this date is weather dependent). There will be signage and flagpersons on-site to help with the transition. The first end-loading ferry run will be from Stella at 6:00 a.m. The ferry service will be end-loading from then on. Please be advised that the anticipated opening of the new temporary docks at Millhaven and Stella is scheduled for the week of March 5, 2018 (this date is weather dependent). The new temporary docks are end-loading which should improve ferry operations by allowing traffic to drive straight on and off the ferry. NOTE: There will be a change to the way you board the ferry and the public parking will be relocated as shown in these images for Stella and Millhaven. Work has been delayed on the Amherst Island Ferry Docks Improvements project due to recent extreme weather conditions. As a result, Rankin Construction has been granted a Noise Bylaw exemption from Loyalist Township that allow crews to work 24-hours a day, five days a week, between January 29 and February 24, 2018. Ferry service will not be affected by this work. The work will be done from a barge on the water. Generally, the work will be moderately noisy with occasional periods of unavoidable loud noise. Temporary lighting will also be required during night work for the safety of the crews. Rankin will schedule noisier tasks to avoid early morning and late-night hours as much as possible. Follow us on Twitter @A_I_ferrydocks and visit this website throughout construction for information and updates. Work continues for the Frontenac II to start operating from the newly-constructed temporary end-loading docks, while the existing permanent docks are demolished and the new ones are built. The specific date for this change is weather dependent and will be advertised two weeks in advance through our Twitter feed, website, and email to those on our mailing list. In addition, signage and flag persons will be on-site during the transition. Follow us on Twitter @A_I_ferrydocks and visit this website frequently throughout construction for current information and updates. Good news, the end-loading ramp installation on the Frontenac II is complete! That means we are finished with this night work and the ferry schedule is back to normal. Thank you for your patience as we work to stay on schedule. There will be parking changes at the Amherst Island Ferry Docks beginning Monday, October 23. Parking at Millhaven will be reduced to 8 – 10 marked spaces, while 15 marked parking spaces will be available at Stella. We are looking for opportunities to add additional parking at Millhaven. Please plan ahead. We apologize for the inconvenience. Construction at the Amherst Island Ferry Docks starts on Monday, October 2, 2017 and will be completed in four stages. If you live near the ferry docks, you will receive a Notice that provides details of the four stages, estimated timing, duration of construction, and where to get more information. You can also view the Notice on our website. The first stage of construction occurs during fall 2017 and the 2017/2018 winter and involves construction of temporary end-loading ferry docks. During this time, vehicle queueing/marshalling, ferry operations, and travel patterns at Stella will not change. At Millhaven, marshalling will be reduced from 36 spots to 33 spots, but you will continue to board and use the ferry as you do now. Parking at both terminals will be temporarily reduced to five (5) parking spaces at Millhaven and fifteen (15) parking spaces at Stella. This is the maximum number of parking spaces that can be provided due to the limited amount of available space. Once construction is complete, parking will be expanded to accommodate twenty-six (26) marked parking spaces at Millhaven and thirty-five (35) marked spaces at Stella. Ferry operations will move to the newly constructed temporary end-loading docks beginning this winter. Signs and other advance notice of this change will be provided, and additional staff will be on-site during the early days to assist in a smooth transition to the new marshalling areas and temporary docks. Updates will be provided via mailout, email, and through the project website prior to each construction stage. 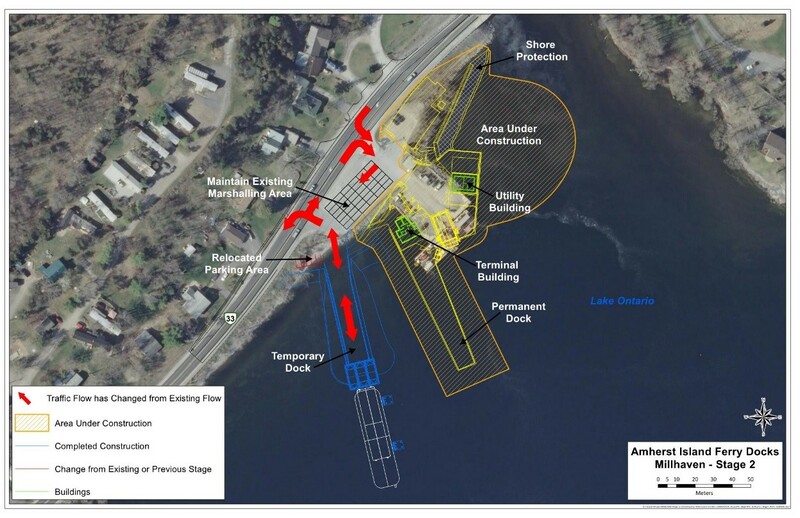 The Ministry of Transportation and Rankin Construction Inc. are following the regulatory approval process that is required to complete the design and construction of the Amherst Island Ferry Docks Improvements. All approvals must be in place to ensure that regulatory requirements are met and the process is open and transparent. We continue with site preparation so that construction is ready to begin when final approvals are received. You will continue to see some activity on-site as we get ready for construction in fall 2017. Future updates will be available on this website and through our Twitter feed @A_I_ferrydocks. Watch your mail for a Construction Start Notice, which will contain information on the timing and duration of upcoming construction. A copy of the notice will also be placed on this website. Off-shore drilling to take place beginning August 21 (weather permitting) in support of geotechnical investigations. No impact to ferry service. 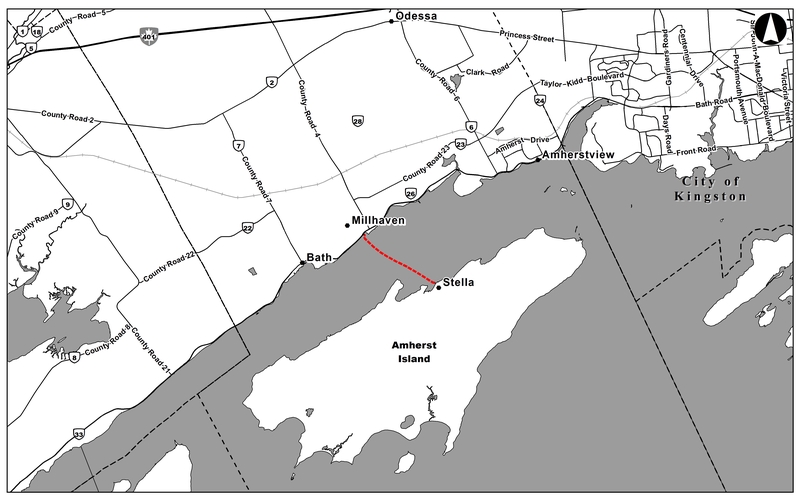 In-water survey work will take place around the Amherst Island Ferry docks over the next two weeks. This work will not impact ferry service. A Design and Construction Report (DCR) has been prepared and is now available for review and comment. The DCR can be viewed on our Documents page. The DCR is available for a 30-day public review starting June 21, 2017 and ending July 21, 2017. If you have any comments or concerns with the project, or the findings of the DCR please submit them through the Contact Us page. The project will be eligible to proceed to construction in summer 2017 following the completion of the 30-day public review period and acquiring permits and approvals. The Project Team will respond to all comments generated during the 30-day public review; however there is no opportunity to request a Part II Order (‘bump-up’) from the Minister of the Environment and Climate Change. On June 8, 2017, there was a three-hour disruption in the ferry service to Amherst Island between 11:30 a.m. and 2:30 p.m. due to a cable getting caught in the propeller of the Frontenac II. The cable was part of a system being used for underwater survey work of the lake bed at Stella and Millhaven. This survey work is an essential part of pre-construction operations for the upcoming contract to improve the ferry docks and involved placing a sensor cable in the channel with one end tied at the shore and the other end tied to an anchored buoy in the water. As the ferry came into the Millhaven dock at 11:30 a.m. the current generated by the ferry pulled the cable from the shore into one of the ferry propellers causing the engine to slow down. The ferry crew immediately shut down the drive unit and ferry service was disrupted while a dive crew was quickly called to the site to remove the cable and inspect the propeller for damages. The ferry crew then took the vessel out with no vehicles on board to do sea trials to confirm the propeller was operating properly in order to safely return back into service. By 2:10 p.m. the ferry returned to the Millhaven dock and ferry service resumed. Thanks to the swift response of Loyalist Township, the Ministry of Transportation and Rankin staff, the situation was resolved quickly and safely. The procedure to perform this survey work has been modified to ensure this does not occur again. Survey work is scheduled to continue during the week of June 19. Rankin fully understands and appreciates the importance of the Amherst Island ferry service and regrets the disruption and inconvenience that occurred. 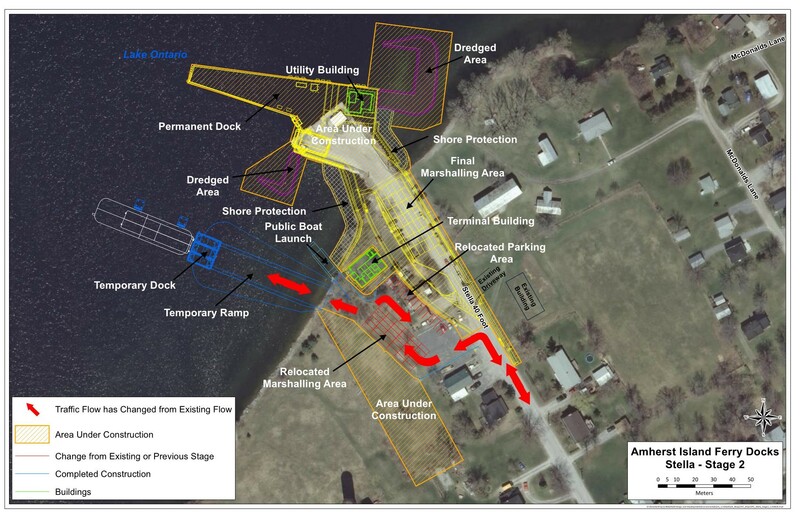 Rankin Construction Inc. (RCI) and their design consultant Morrison Hershfield (MH) have been selected by the Ministry of Transportation (MTO) to construct the Amherst Island ferry docks improvements. The project is located in Loyalist Township, within the County of Lennox and Addington (see map below). The Amherst Island ferry provides year round transportation to and from the mainland terminal in Millhaven to the Island terminal in Stella. The recommended plan for the improvements was determined during an Environmental Assessment Study completed in January 2014. New terminal buildings with public restrooms, bike racks and staff offices. Opportunities for public input and involvement will be provided throughout the project. These are further discussed within the Consultation section of this Project’s website. This website will be updated regularly with information on future public meetings, construction scheduling and project documentation as it becomes available. If you wish to submit feedback, be added to the project mailing list or submit a question, please use the Contact Us section of this website.